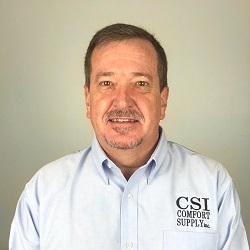 Rick Boucher – Comfort Supply Inc.
I’ve been in the industry for 30 years. I started out as an in-house service tech for a restaurant management company. Then I went to an HVAC contractor in State College as a technician, working my way up to being service manager. I made a move to another contractor and ended up in Altoona. The last contractor I worked with did several City Multi installations, and I liked the product line and wanted to be the expert on it. Duke [Williams] said to me that if I was ever interested in a job, Dave respected good work and that I should contact him. So I reached out to Dave and expressed interest, and he offered me the job on the spot. My favorite thing about CSI is that everybody treats everyone else like family and helps each other out. I like learning new technology and being on the cutting edge. Troubleshooting is something I enjoy doing with customers, and I like providing solutions for them. I have contributed to two articles in the ACHR News on VRF installation and maintenance. I’m also a home brewer – I do quite a few different types, but mostly ales.